Over 50% of the traffic now comes in through search results. If you’re not near that 50%, you’re missing half or more of the traffic your website should get. Feeling discouraged? Don’t. Small business SEO is the answer. But you’re running pay-per-click ads, so do you really need small business SEO too? Quite simply, yes. You could be spending upwards of 3-5 times more on your pay-per-click advertising than you have to. Google charges businesses more per click if they don’t optimize for user experience. The good news is that you can start taking simple and strategic steps to improve your ranking in searches. Let’s look at how it’s done. Search Engine Optimization (SEO) is the act of aligning your website to how search engines find what people are looking for. Through it, you maximize your visibility in search results. SEO experts employ a series of proven strategies to achieve this level of optimization. SEO for a website requires a strategist to apply and maintain many strategies at once. These strategies don’t stand alone. They work cohesively to get results. Begin by applying these strategies today. Start increasing traffic and conversions through small business SEO. Is SEO Good for Small Business? Many people ask if SEO makes sense for small businesses. Or should they focus primarily on social media, pay-per-click ads or TV spots? The simple fact is that every business should be investing in SEO. SEO amplifies all of your other digital marketing efforts. Whether you’re a local law firm or an ecommerce shop, SEO makes your website the best and most visible it can be. Before you begin improving your website, it’s important to know where you stand today. Otherwise, how would you know it’s working? You can invest in some paid tools to obtain more in-depth look at your site. But these free tools will get you started. You can even set up custom reports to track how people flow through content marketing funnels you set up on the site. Explore both Google Analytics and Search Console. You’ll find new and better ways to understand how people interact with your website. This is Bing’s version of Google Search Console. It’s not a must. But it can be helpful to see how people interact through Bing search engine when doing small business SEO. Finally, it’s important to understand how people are interacting with you on social media. As you begin to apply these small business SEO strategies, you see these numbers improve. Small business SEO begins with a responsive web design. Without it, any efforts you make will have little to no impact on your traffic. Search engines like Google pay attention to how visitors interact with your site. A strong user experience is an important part of small business SEO. If people are clicking away within seconds, Google will reduce your visibility in searches. That reduces traffic. A responsive web design includes 4 major components. In the words of Apple co-founder Steve Jobs, “Design is not just what it looks like and feels like. Design is how it works”. The website should do well what it sets out to do. If it can’t do something well, it should do something else. Sacrificing user experience to be trendy or turn heads isn’t good web design. How does someone navigate through your site? Is navigation intuitive? Do you give them too many choices? The simpler your navigation can be the better. Kissmetrics Research Firm studied the impact of site speed on ecommerce sites. They found that a 1-second delay can slash conversions by 7%. So a 2-second delay can slash conversions by 14%. If your page is loading at 4-5 seconds, that’s significant lost revenues. 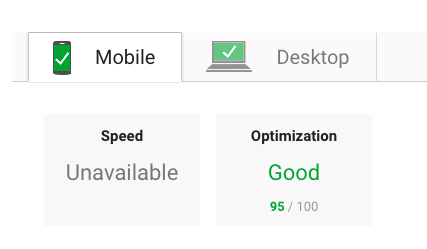 You can start using Google PageSpeed Test to check your website. It will make suggestions for speeding up your site. Let’s look at some things you can do now to speed up your website. Optimize your images. Images that are significantly larger than the size on the site take more time to load. Use the tools in an image viewing program to reduce their sizes. Make a small adjustment in programming to load all text before images. This way, people can start reading if it takes a couple seconds for images to catch up. Avoid excessive redirects. Redirects serve a purpose of redirecting someone who clicks on a page that has moved. But use them sparingly and smartly. 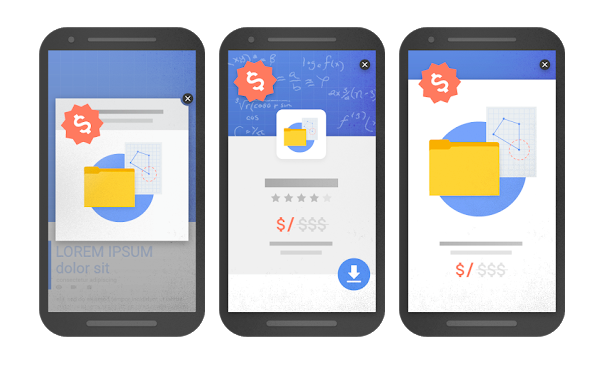 Google cracked down on ads that impact the mobile user experience a couple years ago. They’ve recently announced that they’re extending this to desktops. Called the intrusive interstitial ad penalty, it punishes websites that have ads that pop up, taking over the whole screen. To be safe, make sure ads aren’t overwhelming content, hard to close or otherwise interfering with experience. Here are some examples Google provided to demonstrate what an intrusive ad looks like on a smartphone. Note that they are taking up most of the screen. The small one may look okay at a glance. But notice the gray area around it. It makes it hard to click around it. Many modern content management systems like WordPress or Wix, create default URLs based upon page and blog titles. These can be long and may even include nonsense characters. When creating a new page, create a short descriptive URL with two to three words max. Don’t hit publish until you’ve changed it. Your website should be visually-appealing. Include crisp and relevant high-resolution images and well-organized text. If the page looks like a mess, visitors will leave quickly. That’s the opposite of small business SEO. SEO is not only about getting more traffic. It’s about attracting the right traffic. If you apply strategies that bring in the wrong people, you’ll have low conversion rates. People will flee your website. Create customer personas so that it’s always clear who you’re creating your website for. Once you’re clear on who your target customers are, you can begin doing keyword research. It’s very important to mention a common misunderstanding here. Search engines like Google stopped using “exact match” keywords to pull up search results over 3 years ago. “Exact match” is how we ended up with people using ungrammatical phrases like “Car Wash Dallas”. People entered it like this in searches so content creators did as well. Regardless of what a keyword is, always write it in a grammatical way. Advanced search engine algorithms will take care of the rest. A long tail keyword is a phrase that includes 3 or more words. The reason we use long tail words is because they’re more descriptive. They’re, therefore, more likely to attract the right audience. On top of this, a more descriptive keyword helps search engines better understand what your page is about. You can use tools like Google Keyword Planner, to research keywords. You can also use paid tools like Ahrefs, Moz, etc. 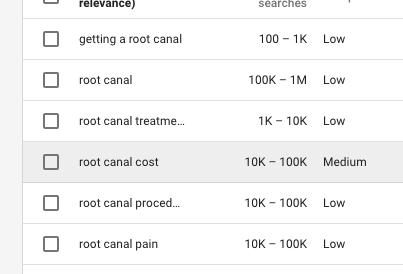 Here’s a shot of Google’s Keyword Planner when we search for keywords related to “root canal”. Notice, it tells you how much traffic that a word gets as well as the competitiveness. If you hire a company to do your small business SEO they’ll be experts at using these advanced tools. Some paid tools are often cost prohibitive for a small business otherwise. Look for a combination of low, medium, and high-competition words. Gaining traction on the low competition words helps you tackle the competitive ones. Each page on your site should have its own keyword to avoid having your own pages competing with each other for top spots. Latent Semantic Indexing (LSI) keywords are complementary keywords. Using them further helps search engines understand what a page is about. It also helps the search engine know how in-depth the article goes. Search engines reward articles that present well organized, in-depth information. You’ll rank higher. To come up with your own LSI keywords, consider what the most important topics to cover under a larger topic are. But don’t get carried away. You can’t possibly cover everything. All content serves a purpose. It may be to display the benefits of a product you sell. Or it may be brand awareness. To create effective content for small business SEO, get very clear on what objectives you strive to meet with the content. A very effective content creation strategy is mapping out a buyer’s journey. You can then build content around it. Build content that directly speaks to people in one of these stages. By doing so, you’ll be better able to meet the objectives of that content. Only publish exceptional quality content. Bad content is bad for your brand and your SEO. If you sell widgets, you may be tempted to just create a bunch of content about your widgets. But if people aren’t looking for your widgets specifically, they’ll not find or consume content. Create content around topics that people are actually interested in. These topics should align with your target audience and objectives. Want to know a very effective way to figure out what industry topics people are interested in? Spend some time on social media and forums like Quora or Reddit where people rate content. Also, plan to spy on your competitors. You can do this manually or use paid tools like Ahrefs to find out what topics get the best results. Tweets with images are shared 150% more than those without. Infographics get 3 times the shares of non-visual media. 4X as many people prefer watching a product video to reading about a product. Stats like these demonstrate the importance of visual content. Multimedia content helps keep people on the page. It suggests that you put some effort into your content. You can evoke emotion, break up monotony, or convey specific information. Researchers use heat maps to track eye movements on web pages. They’ve found that the average person spends more time looking at great visuals than actually reading what’s on the page. You need words for substance. But visuals have an important role to play. To optimize your content, put the primary keyword that you selected within the first 100 words of an article. Use the phrase only where it makes sense. Content should be very readable. Keywords should never seem forced. If you have a single keyword, experts recommend that it should be no more than 1% of your word count. If you’re applying LSI keywords that support a primary keyword, then 0.5% – 0.75% is ideal. Your H1 Heading is the title of a page. Your primary keyword should be in your H1 heading. In other words, it’s in the title of your content. H2 headings are your main headings that break up the content into digestible sections. Your primary keyword and your LSI keywords should each be in at least one of these headings. The meta title and meta description are what appears when someone pulls up a list of search results. These metas need to include the primary keyword you’re targeting. They also should be very clickable. It won’t do you much good to be at the top of searches if you can’t entice people to click. Use these to get attention. Share a little about what your page is about. Lure people in to click and learn more. Social shares don’t directly impact small business SEO. But they do help increase brand awareness and engagement. This can indirectly increase traffic. If this traffic interacts well with the site, it demonstrates to search engines that your site deserves higher ranking. Place social button prominently on the page to encourage sharing, like the ones you see at the top and bottom of this blog. 80% of Internet users own a smartphone. Over half of website traffic is now on mobile devices. Nearly 60% of consumers won’t recommend a business that has poor mobile design. Over 80% won’t return to your website. Google understands that a small local business doesn’t have the power to compete with Amazon-type companies. They don’t think you should have to. They’ve put a system in place that attempts to reward local businesses with great visibility in their local area. Even if you’re an eComm business, you can use this to gain traction locally. Don’t overdo it. But do include it in several places. Further demonstrate you’re local by getting added or claiming your review profiles. Type “Your Company Name + Reviews to locate them. The big ones are Yelp, YP (Yellow Pages), Google My Business. Other relevant review sites like Trip Advisor or Home Advisor. 84% of people trust reviews as much as they do a friend’s recommendation. One 1st page negative review can steal up to 44% of small businesses customers. Part of small business SEO is showing your best face in search results while diminishing the impact of bad reviews. Having consistent information on these sites helps search engines identify who you are. Following up on bad reviews shows you are a trustworthy company that deserves higher ranking. If you have some coding skills, take this a step further by applying schema marketing. This code helps search engines better understand what your site is all about. It creates richer displays in search results. This is the code that allows some websites to appear in search results like this. A sitemap is a document that lays out the URL and other information about each page of your website. Submit it in Search Console and Bing Webmaster to make sure they can find and index all pages on your website. When you publish a new page, submit it to these search engines to get found faster. Backlinks are links that come from other websites to your site. Search engines like Google consider these votes of confidence in your site. Google considers these links as part of the ranking algorithm. A very relevant link from a high authority website will help increase the authority of your website. But not all links are the same. Because links are so powerful for SEO, search engines allow websites to mark some links “no follow”. This means that they are okay linking to your site. But they don’t want the link to be a vote of confidence. No follow links aren’t worthless. People can still click them and visit your site. But they don’t increase your ranking directly. Normally you obtain these by collaborating with another business or website. Your business might hold an annual fundraiser for the high school band or the Humane Society. You could ask for a permanent page on their website talking about the fundraiser and linking to your business. You might also offer to contribute a high-quality article to a website for free in return for a do follow link. This is called a guest post. If you want this link to help your site rank, the website will ideally belong to a non-competitor website in your industry. It’s also important to create very linkable content. Creating content that is very helpful or contains one of a kind information is a great way to get others to link to your site. As stated earlier, social media doesn’t directly improve small business SEO. But it’s very important. It helps you gain initial traffic so that search engines can begin judging the effectiveness of your site. Build a brand on social media. Leverage social media to demonstrate your commitment to your customers. Share your website content. Curate and share other relevant content to increase your followers. 1 in 3 people prefers contacting customer service through a social chat function to calling or emailing. Nearly 70% of people now regularly use social to get help from a business. Customers that have a positive social media experience with a brand are 3X more likely to recommend the company to others. This leads to more traffic, better reviews and higher rankings. Small business SEO can help you increase your search engine ranking. With more visibility, you’ll get more traffic. When small business SEO is done right, this traffic is high-quality. This means higher conversion rates, increased revenues and a healthier ROI on your marketing budget. Each strategy we discussed isn’t hard to implement by itself. But to maximize results you need a comprehensive plan that puts these strategies to work. That’s where we come in. Find out how we can help you grow your business. Contact us today!